Knitted Thoughts: Never. Ending. Lace. So... this week I'm not only stuffy, achy and sniffling, I don't even have anything really comforting to knit! I'm trying really hard to finish the current work in progress before starting something new, so as not to add to the mounting pile of unfinished projects taking up space in my office ...but this is seriously testing my resolve. I'm adding the lace border to the Stonington Shawl and it's lovely, but tedious. It's also endless. The fact that I have really cruddy math skills isn't helping either. The border is worked back and forth over 18 stitches and 18 rows, which connect to the shawl by those open stitches I'd placed on hold for each side. By the way, never use scrap yarn of the same weight and color as your working yarn... those stitches were a serious pain to see and pick up. Anyway, back to my bad math: Each side of the shawl currently has 145 open stitches, so I'd been consoling myself that even though the lace pattern repeat was a bit irksome, I could force myself through roughly 8 repeats per side. 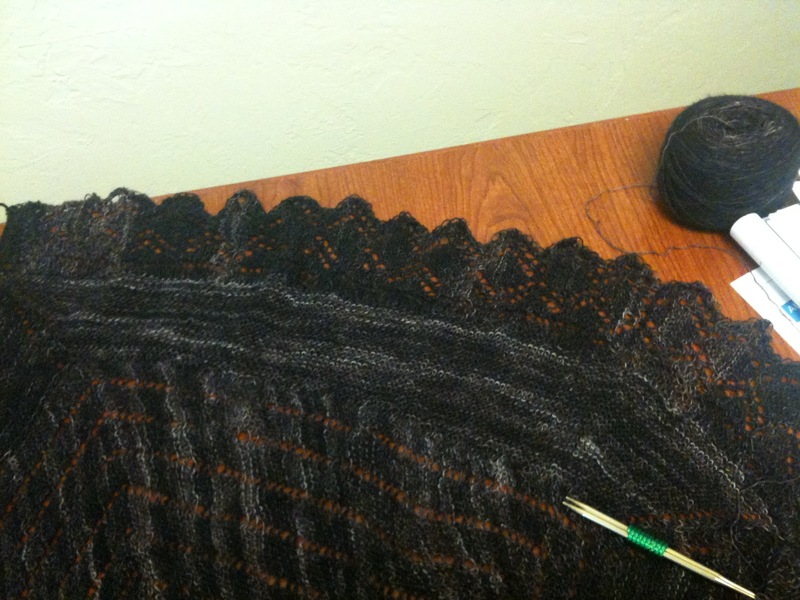 It wasn't long (well actually... it was stupefyingly long, but let's pretend) before I realized I'd completed like 6 repeats and was not even to the middle of one side. Hah! Idiot! 18 rows back and forth means that I only pick up an open stitch from the scarf once every OTHER row! That translates to a little over 16 pattern repeats per side. Crap! I've only barely rounded one side. Tiny little stitches, watery eyes from my lousy cold & way too much ripping and re-knitting to fix stupid mistakes --- I'm averaging about 25 minutes per pattern repeat! Just shoot me now and put me out of my misery. I've done the math -- with a calculator this time -- and at my current, pathetically slow pace -- I'll have about 20 more hours of lace repeats before this bugger is finished. I do this for fun right? Because it relaxes me, yes? I don't know... I smell a sock starting. The only thing keeping me at this is Charlotte's pleading. 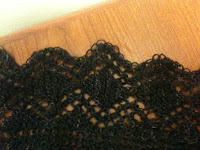 My consolation -- the lace really is quite pretty and once it's blocked it'll be gorgeous. But, I do have to add that I'm not overly thrilled with the way the variegated, lighter areas of the yarn are pooling on this. Nevertheless, I slog on. I will say this though. If I finish this thing and she leaves it out somewhere for the kittens to shred.... well, I don't think any jury of my knitting peers will hold me responsible for my actions. Wow. That is beautiful! As a beginning knitter, I'm sticking to scarves, and easy ones at that, until I get some more skillz. You are my knitting hero.